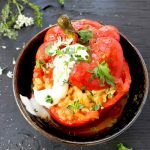 Hands down the best vegetarian stuffed peppers recipe ever, easy, hearty and healthy made with wild mushrooms and arborio risotto rice Italian style. 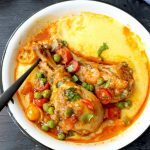 Cooked in a San Marzano tomato sauce, can be finished on the stove top, in the oven or even your crock pot. You guys, I’m just here to talk about what is the best stuffed peppers recipe of all time! I swear on my saffron, they are irresistible! I totally realize the thermometer shows like 95”F outside, but seriously, who doesn’t love good comfort food regardless of the weather ? And is there anything out there that even comes close to a home cooked meal like this? Me thinks not! What makes this the Best Stuffed Peppers ? the different color bell peppers are loaded with sweet flavors and nutrition. can be made 100% plant based, vegan, stuffed with flavorful wild mushrooms. instead of the more traditional ground chicken, beef, sausage or pork filling I used to make for the BatMan before. they are cooked in the tastiest broth/ sauce, made with San Marzano tomatoes and organic vegetable stock. The best way to cook stuffed peppers truly is in all that flavorful tomato sauce. they are super easy to make, gluten free and can be prepared a couple of days in advance. a pot of these peppers will feed and satisfy the hunger of 7 or 8 adults. Depending on how many you can really fit in your pot of course. You have a big dutch oven right ? swap the risotto rice for quinoa, couscous, barley or quick cook brown rice. I could try and describe more in depth the magical combination of flavors going on in these peppers, but honestly i wouldn’t do it any justice. You’ll just have to make them yourself! This is the best and only vegetarian stuffed peppers recipe you need! Make it your own! If you like lots of sauce in your bowl, just add more liquid and cook this recipe more like a tomato stuffed pepper soup. a nice drizzle of organic sour cream or creamy greek yogurt. lots of Italian ciabatta or homemade crusty bread. Bread is everything! 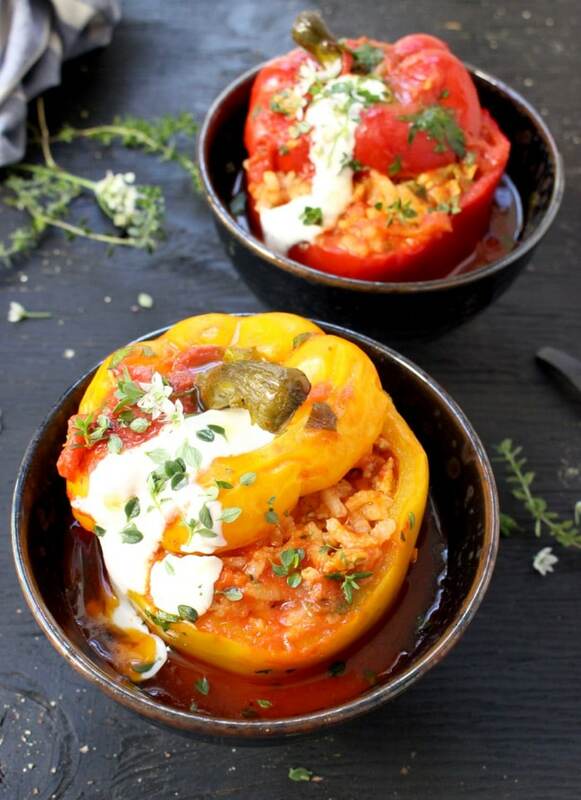 Hands down the best stuffed peppers recipe, easy and healthy made with mushrooms and risotto rice instead of ground chicken or meat, cooked Italian style in a San Marzano tomato sauce. Preheat your oven to 375" F.
Rinse the peppers and cut the tops and empty the seeds and membrane. Reserve the clean tops also, you’ll need to place them back on top after you fill the peppers. Crush the tomatoes with your hands and add a layer with juices to the bottom of a large enameled cast iron pan. In a large saute pan heat up the olive oil and saute the onion with a pinch of sea salt until softened and translucent. Add the rice, stir and let cook together for about 5 min. Mix in the mushrooms ( or ground chicken If using meat) and stir with a wooden spoon. Add the thyme leaves, parsley, 1 tsp sea salt, pepper and paprika and mix well together. Cook for a few minutes until the mushrooms start to soften a bit and remove from heat. Stuff each pepper with the rice mixture ¾ of the way up (very important not to over stuff them). Put the tops back on, just to make sure the stuffing will stay inside.. 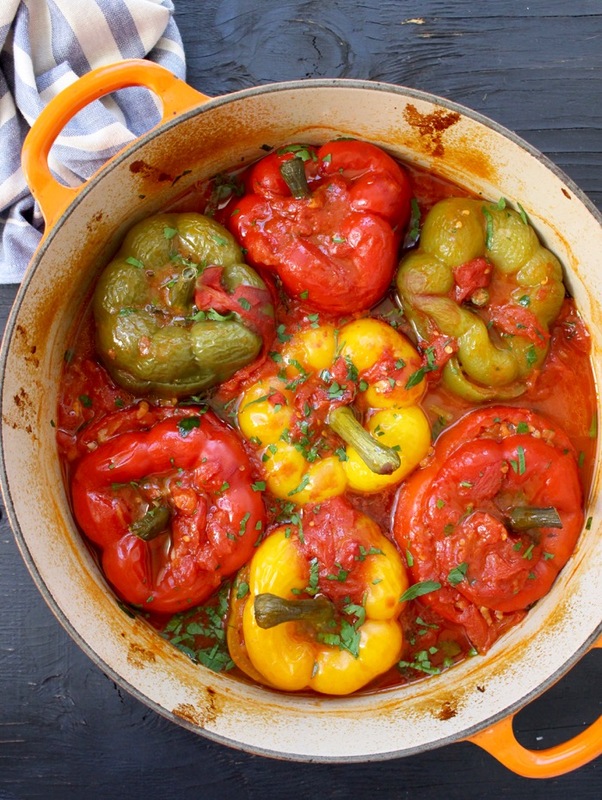 Arrange the peppers in the heavy bottom sauce pan on top of the tomato layer. Pour in the stock and the remaining crushed tomatoes making sure it comes all the way up the sides of the peppers. Add the bay leaves and thyme sprigs and transfer the pot to the preheated 375 degrees oven for 50 minutes. Remove from the lid and allow the peppers to cook uncovered for another 10 minutes. 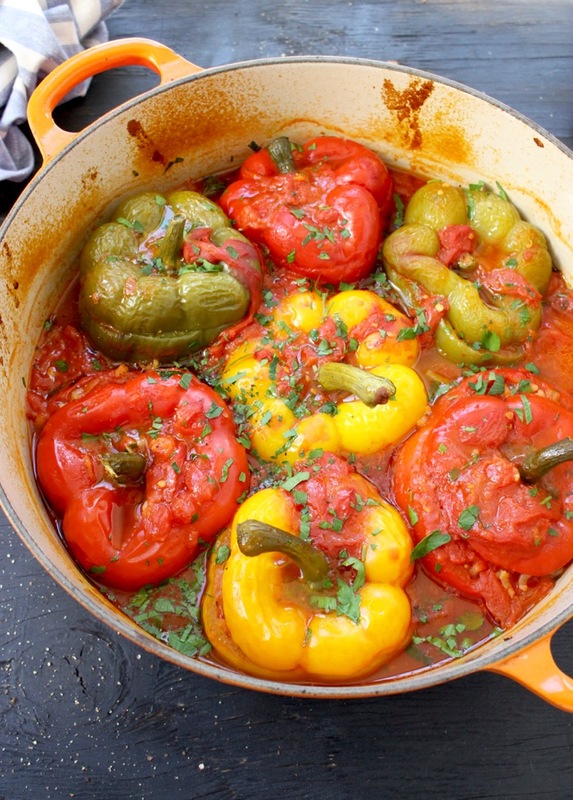 Remove the pot of stuffed peppers from the oven very carefully and allow it to sit covered for 10 min before serving. Serve with a drizzle of sour cream and garnished with fresh parsley and thyme. Follow the recipe above and add the peppers to a large slow cooker. Cook on low for 6 -8 hours or until tender and the rice is cooked through. 1. Serve the stuffed peppers warm surrounded by the broth they were cooked in and drizzled with sour cream or greek yogurt. 2. If you happen to have any chicken and rice mixture leftover, just spoon it in the pot around the peppers to cook together. 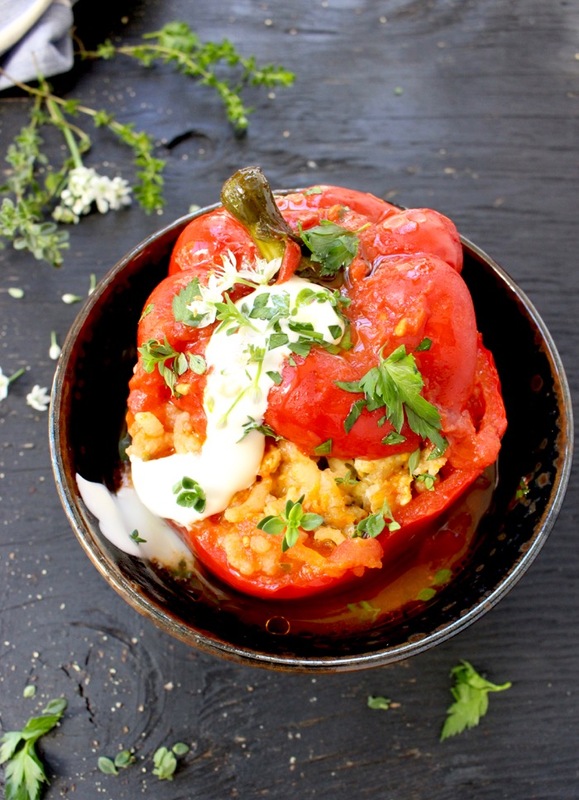 I love how you used risotto in these stuffed peppers! Looks delicious! Wow! These look amazing! I want them for dinner today! 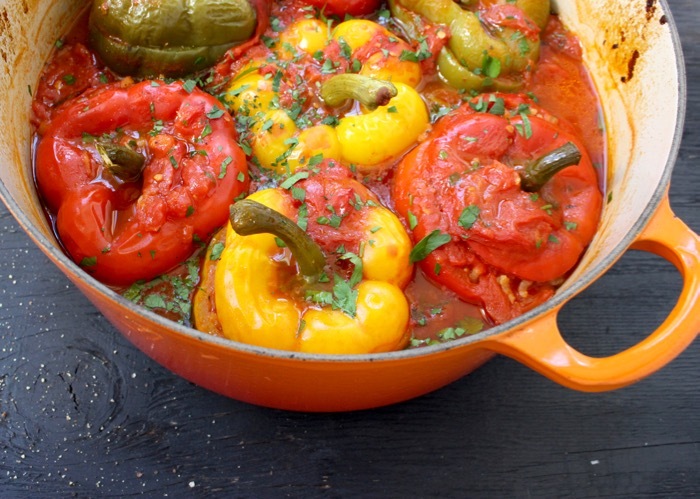 I love how easy and yummy these peppers look!! I grew up with stuffed peppers, so they bring back many amazing memories. Yours look fantastic! There is no doubt that this is a great recipe! Looks so flavorful and delicious, my mouth is watering just looking at the pictures. I love stuffed peppers, and these are fab!! I have yet to use ground chicken in peppers, but now I’m definitely going to give that a try. Oh yes, ground chicken in stuffed peppers is the best. Just make sure to use ground dark meat so it doesn’t dry out. I never liked stuffed peppers as a kid, but as an adult I LOVE them! These look awesome! These stuffed peppers look lovely. And it’s great that you can make them in advance. 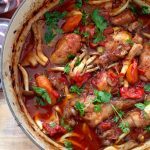 Love everything about this recipe, but my heart skipped a beat at risotto rice cooked in San Marzano tomato broth. Sounds wonderful! Totally love stuffed peppers. 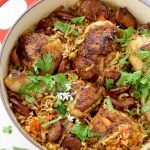 They are such a great one dish meal, and you can stuff them so many ways. They make awesome leftovers too. I love to make lots and freeze them. Perfect to take out on busy days and still have a great meal. Love that you used ground chicken in this recipe! every Italian cell in my old body expands when I read a recipe such as you just shared with us. we buy our organic fruits, vegies and chickens, from our Mennonite family friends, all colored sweet peppers included, and we have our own gigantic herb garden, crowded with lovely herbs. we use herbs in most of what we eat, including oatmeal in the morning. will definitely have stuffed CF peppers in the coming days. Hi Ricco, I just pictured everything you just described and it sounds like heaven! That is living right. Please report back on the peppers, hope everyone loves them as much as we do! Stuffed bell peppers are so great- and great for people who have portion control problems! 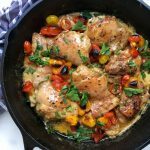 I love that you used a combination of bell peppers! These look amazing and I know my family would love them! LOVE stuffed peppers! These look amazing! Stuffed peppers are one of my favorite things! I can’t wait to try this version! I have a bunch of peppers from my CSA box, I’ll have to try this! What a wonderful recipe they are everything you have described. This is a forever recipe. Thank you for sharing. We made these stuffed peppers and they truly are the best. I combined chicken and wild mushrooms in the filing and the favors were amazing. A keeper for sure. I would be so proud to serve this dish. It’s not only delicious looking, the colors are stunning! I honestly cannot take my eyes off it! PINNING! Hi! I made these tonight for dinner and the flavour was incredible. However, I live in a very small town that doesn’t sell risotto rice. I used basmati rice instead. In your directions it didn’t state to cook it first, and mine came out crunchy. Do you think that’s because I used a different rice? It needs more cooking time and/or higher heat. The peppers weren’t quite cooked enough and the risotto was definitely not cooked enough. The flavors were good. I used dried seasonings instead of fresh and added garlic powder. Made these tonight! I added cannellini beans and spinach to the rice mushroom mixture to add protein. I had to put it back in because the peppers were still crunchy. Overall great flavor!